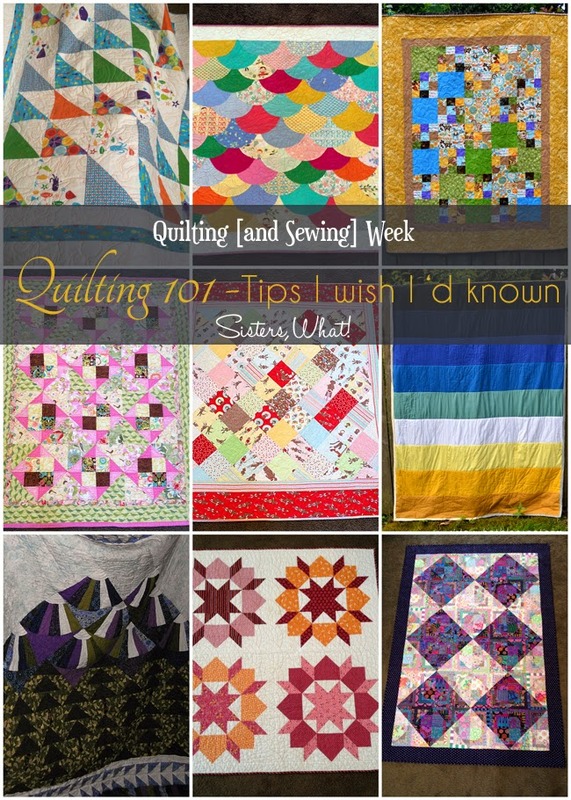 ' Quilting Tips and GIVEAWAY - Sisters, What! Here we are at the end of our Quilting and Sewing week. Well more quilts than anything, but we had many quilts to share. And guess what, we still haven't shared them all! But don't worry, they will all make there appearance on this blog sooner than later. My Mom taught me how to sew when I was young probably 10 or 12. I sewed pajamas, skirts, and for my first girls camp I sewed a quillow (a quilt that folds into a pillow). My first venture into sewing a quilt with more then just squares was over 8 years ago, and I really didn't think it would be that hard. Lets just say I learned the hard way while making a King size quilt, that I now do not use because it was made for someone who isn't in my life anymore. So as Part of our giveaway I wanted to share a few tips that I have learned are invaluable. I don't claim to be an expert but these are tips that I wish I had known. I am going to link to other blogs that have great tutorials to follow. Learn about cutting mats, rulers, rotary cutters and love you sewing machine. I couldn't believe the difference when I upgrade my machine. I was constantly frustrated before and would end up more stressed after sewing. When I upgraded all that went away and I could de stress while sewing instead. If your machine doesn't come with a quarter inch seam, practice or buy a quarter inch seam foot. And then practice. This will save you a headache when you are trying to match up small pieces and finished blocks. I used to get so frustrated that my blocks weren't coming out even close to the same size. I hate ironing. I used to just avoid that step when quilting but I have learned the importance of it. If you want to make blocks and seams fit together properly and also for them to look professional, IRON. If a quilt pattern says to iron a certain direction, believe it, they know what they are talking about. When you are working on a quilt finish all the blocks before putting any of them together. Then square them to the same size. I promise you this will save you headaches and time as you won't be seam ripping them apart. And a this is an all important last step to finishing your quilt. The only thing I do differently is that I hand sew it to the back. That is the look I like. This is my Jelly Roll Jam Quilt top that I made out of the Wishes Fabric Jelly Roll. I loved how simple it was and how quickly it came together. Now I just need to get it quilted. 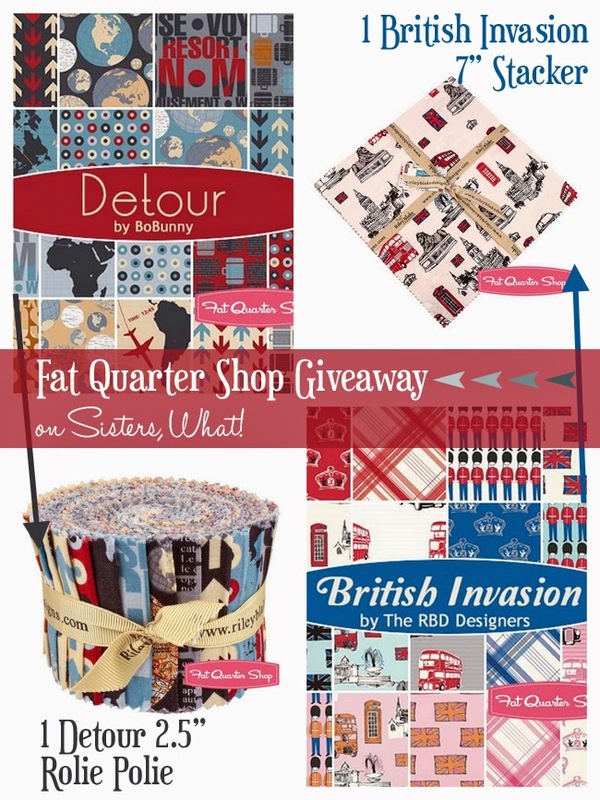 Ok now onto the fat quarter shop GIVEWAY!! Enter using the rafflecopter below. The giveaway will end in one week from now until July 27th. Great giveaway thank you for the chance. I think I'd make a quilt with it! I would love to make a quilted purse with the fabric. I'd make a picnic quilt !